Remember: ALL SPOILERS must be put inside the spoiler tags. If you post spoilers without tags your comments will be deleted. Repeat offenses will result in you being banned. Please stay on Topic. If you want to chat about anything at all please use the Open Discussion Threads. Each day (except Sunday) during the main TV Season we post the TV Ratings for the previous nights primetime shows for the major broadcast networks (ABC, CBS, CW, FOX, NBC). Cable Network ratings will be added to the Ratings Database. The first item that gets posted (normally around 2pm GMT) is the early overnight analysis based on the early household numbers (these are not the same as the Total Viewers and 18-49 Demo numbers that are posted later). Next, if available, we will post the Top 25 Market 18-49 Ratings to give you a rough idea of the ratings to following. Later on (normally between 4pm-5pm GMT) we post the official early overnight Total Viewers and 18-49 Demo numbers in the table above (We also where possible now post the 18-34 and 25-54 Demo Numbers). 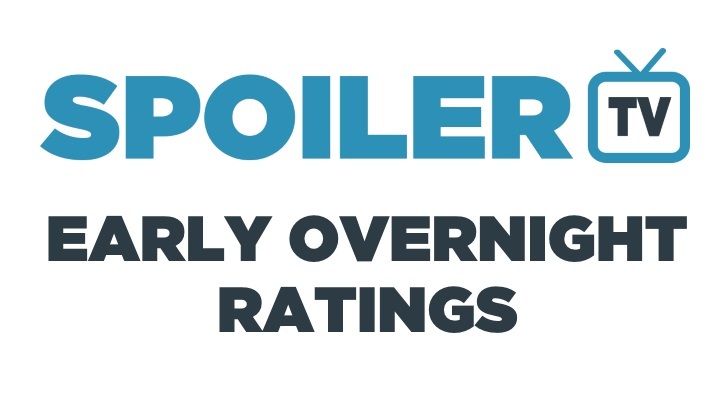 Finally, later in the evening (9pm-10pm GMT) or the following day, the final adjusted ratings numbers are released, these are then posted in the Ratings Database. The Final Adjusted numbers are what we use for all our Renew/Cancellation Tables, Full Season Tables, Ratings Scorecards etc . Friday's Final Adjusted Ratings are normally available on the following Monday (9pm GMT), whilst Sunday's will be available on Tuesdays (3pm GMT).